The Motorola Q Black is the same Q that Verizon Wireless started shipping back in May, but with a sleek new black exterior. Motorola hasn't yet expanded the Q to other network technologies like it was first expected, but rumor has it that Sprint's version (it should also be black) is sitting in the pipeline ready to launch. 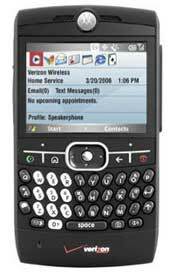 Verizon Wireless is selling the Motorola Q Black for $199.99 after a new two-year contract and $50 mail-in rebate. That's currently the same price as the original silver edition. It's also an online exclusive until mid-January.